Warranty: All Allen's Naturally Laundry & Cleaning (liquid and powder) products are 100% refundable within 30 days of purchase. Please email us if you are at all dissatisfied giving us the opportunity to correct the problem. Allen's Naturally liquid laundry detergent cleans clothes and cloth diapers thoroughly, yet is gentle on fabrics leaving virtually no residue or perfume that can irritate sensitive skin. One ounce leaves clothes clean, bright and fresh-scented. The same one ounce pump the fits the gallon also fits the quart size for easy dispensing This pump can also dispense a 1/4 oz. restrictor clip for HE washers. 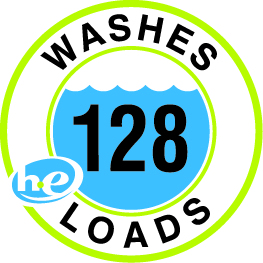 This quart of laundry detergent can wash 128 loads in HE machines or 32 loads in standard machines. Great cloth diaper laundry detergent! Perfume and dye free laundry detergent will gently clean laundry while keeping your baby safe from unnecessary irritation. Inexpensive at 10 Cents per Load! Recommended by many cloth diaper manufacturers including AMP Diapers, Bum Genius, Fuzzi Bunz, Kissaluvs, Snap-EZ, Bumkins and Wonderoos. 5 based on 24 reviews. Leave a Review. I have been using Allen's naturally liquid laundry detergent for several months now and it's my new favorite detergent! I bought it because of it's EWG rating and because it was also highly recommended for cloth diapers. Both of my boys have severe eczema and sensitivities to dyes, fragrances, and chemicals. I use it for both cloth diapering and our regular laundry. I love that it doesn't leave a residue or potent smell and that it doesn't take much at all in my HE front loader machine. Make sure you buy the pump, as it's a pain to pour it without one. The pump makes it so convenient and I love that I can use it for both cloth diapering and regular laundry. I have chemical sensitivities and cannot use the commercial brands. I also am allergic to Coconut. Yay me! Allen's doesn't have any of that stuff. It also cleans really great - no artificial smells, just clean!! Sometimes I add stink out - not for stinks but because the light citrus smell is a nice add. Other times, I add a damp washcloth with essential oils to the dryer. I have been buying Allen's products for about 2 years now and plan to continue! I have been using Allen's Naturally for about 5 years. It was recommended by my dermatologist after she diagnosed me with a formaldehyde resin skin allergy. I can trust it to clean my clothes, sheets, etc. without antagonizing my skin. I have severe MCS and this product was recommended to me. I've been using it for 2 years now and it is fantastic. I have no problems wearing clothes that have been washed with Allen's Naturally laundry detergent. I use it for my whole family. Thanks Allen's Naturally! I love this detergent for my babies diapers and clothes. I've been using this detergent for almost 3 years and don't plan on switching to anything else. Don't waste your time and money on detergents marketed toward being "baby friendly". This stuff is great on the everyones clothes and doesn't include harsh chemicals. I've read a lot about natural detergents not being strong enough for washing cloth diapers but I have to say this stuff works every time. A small amount goes a long way and they ALWAYS come out clean. I have been using Allens Natural Liquid Laundry Detergent for about 4 years. This is not just for cleaning diapers but for people who cannot tolerate fragrances looking for a natural detergent. I have heavily stained items and this detergent gets everything out. I also have very extreme chemical sensitivities (MCS) where I am unable to work due to my condition and this detergent works for me. It only has about 4-5 ingredients which is what I look for being so sensitive. I could not find any detergents prior to this that didn't have a slight scent even natural ones. This one really does work for those of you who are really sensitive like myself. I just use a standard washing machine on delicate cycle and warm sometimes cold water and it cleans everything. Hot water is not needed. Love this detergent. It last a long time. I read great things about the product working well for cloth diapers and being gentle for baby items, so I bought it thinking I would try it out before our baby arrives. Now we use it on EVERYTHING! It has a great neutral scent that isn't overpowering but still leaves clothes smelling fresh. Now we use it for baby clothes as well as our own. The only reason I gave it 4 stars instead of 5 is that the piece of plastic that is supposed to go on the pump to lessen the amount used for HE machines doesn't work at all. It slips over the edge of the pump and if you aren't paying attention, you end up using a full pump instead of a partial one. That could definitely use some improvement. But otherwise, everything else about this detergent is awesome! I washed all of my son's cloth diapers, clothes and blankets with Allen's Naturally Natural Liquid Laundry & Cloth Diaper Detergent before he was born in July 2016 and I've stuck with Allen's Naturally since then. It turns out that Weslee's skin is extremely sensitive, and it's a great relief that Allen's Naturally is good for his skin, and that his laundry is nice and soft for him. I chose Allen's Naturally because I was careful to look for a laundry detergent that would be gentle for a newborn's skin, and that would be good for cloth diapers - especially since I have hard water. Allen's Naturally fit the bill, and hasn't let us down! His clothes, cloth diapers and cloth wipes wash up nicely, and his cloth diapers and cloth wipes are still soft and absorbent. I have a Standard Washing Machine and I use the 1/4 ounce suggested on the instructions, which works well. I have not tried another detergent for my son's clothes or diapers. He has very sensitive skin, so I feel fortunate that the first detergent I tried for him works so well, and I have no desire to test fate or try to compare Allen's Naturally against other detergents.